Has it been 9 months since the very innovative and challenging CFDA + Lexus Fashion Initiative began? It must be, because on the night of June 26th, CFDA and Lexus came together to announce the winners of the contest. As a culmination of the nine-month sustainability-focused program, Rosario Dawson and Abrima Erwiah’s STUDIO ONE EIGHTY NINE were awarded this year’s grand prize of $80,000, and CIENNE’s Chelsea Healy and Nicole Heim received the runner-up award of $10,000. 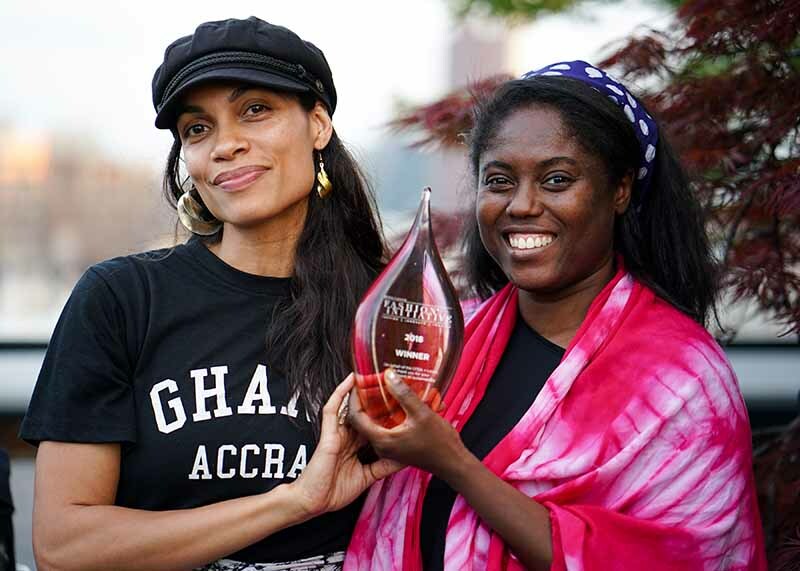 The 2018 CFDA + Lexus Fashion Initiative grand prize winner STUDIO ONE EIGHTY NINE is co-founded by Rosario Dawson and Abrima Erwiah. The label is an artisan produced fashion lifestyle brand and social enterprise, made in Africa that produces African and African-inspired content and clothing. The mission of STUDIO ONE EIGHTY NINE and the idea for Fashion Rising took shape following a trip with V-Day in February 2011, through Kenya, Burundi and Rwanda to Bukavu in the Democratic Republic of Congo for the opening of the City of Joy. The brand currently operates a store in NY and Accra (Ghana), an ecommerce site, a manufacturing facility in Accra, and supports various community led projects in Africa and in the USA. “We work with artisanal communities that specialize in various traditional craftsmanship techniques including natural plant-based dye indigo, hand-batik, kente weaving and more. We focus on empowerment, creating jobs and supporting education and skills training.” Says the company’s website. STUDIO ONE EIGHTY NINE and CIENNE are both female-founded and owned brands. Both will use their grant money towards prioritizing sustainability for their respective companies. Additional finalists in this year’s program included, WHIT, M.Patmos and St. Roche. The CFDA + Lexus Fashion Initiative is a 9-month business development initiative for designers with the aim of elevating the level and percentage of sustainability within their business. The program focuses on the environmental, social and financial challenge faced by the five participating brands. Photos by Angela Pham/BFA.com, courtesy of CFDA +Lexus Fashion Initiative.